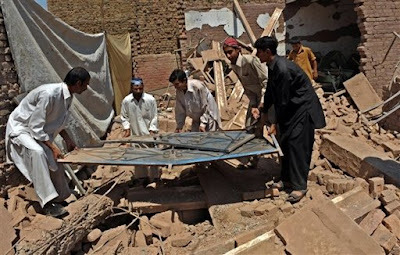 Taliban has been busy destroying girls schools as they probably consider girls getting educated highly unislamic. Not sure where their knowledge come from but I would have thought that with so many problems around at the moment they would focus their energy on something else. Last month in Afghanistan, many girls schools were poisoned by Gas and in one instance around 90 children became critically ill.
Now this month, the same is happening in Pakistan around Peshawar. Allah says in the Qur'an, "The Believing men and Believing women are protective friends to each other. They command what is good and forbid what is evil…" (At-Tawbah 9: 71). The attitude of the Qur'an and the early Muslims bear witness to the fact that woman is, at least, as vital to life as man himself, and that she is not inferior to him nor is she one of the lower species. Had it not been for the impact of foreign cultures and alien influences, this question would have never arisen among the Muslims. The status of woman was taken for granted to be equal to that of man. It was, of course, a matter of fact, and no one, then, considered it as a problem at all. Every Muslim, whether male or female, is obligated in Islam to seek at least the basic education in religion. Based on many such proofs in the Qur’an and Sunnah, Muslim scholars have ruled that seeking essential knowledge of the beliefs and practices of Islam is an obligatory duty of every Muslim, regardless of gender. It is common knowledge that as Muslims we must practice Islam in order to gain salvation. Scholars tell us that our practice of religion is not valid or acceptable unless it is based on sound knowledge. It follows from this that seeking knowledge about the essentials of religion is an obligation on both males and females. Religious education aside, Muslim women must also strive to acquire essential life-skills that would make them self-reliant. If we take into account the volatile nature of social circumstances in this daytime and age, it would be suicidal for Muslim women to ignore such training; Allah warns us against dragging ourselves into perdition. Still another factor to consider: In Islam, women’s roles in rearing future generations of Muslims are far more crucial than that of men. It goes without saying that we cannot rear intellectually and physically healthy children unless mothers are educated and can, therefore, educate children. Based on this fact, it is not at all amazing when we see that all of the great scholars of Islam had educated mothers who planted the first intellectual seeds of greatness in their lives. I would like to understand these people who are killing innocent children in the name of Islam, where they are getting their spiritual knowledge from. Do they think they will ever go to Jannah after commiting such heinous crimes? Lets not forget the Kharijites as their behaviour has become like them.